Math in Moscow is a wonderful program; I learned a tremendous amount, mathematically, culturally and otherwise. Спасибо ! Math in Moscow is a great opportunity to think deeply about math with some wonderful professors and fellow math undergrads. I’m very thankful for my semester here. It’s also been fun to get a bit better at Russian language ! Math in Moscow was a wonderful program. It gives opportunities to accomplish whatever you want in Moscow. The Russian approach to mathematics gives a different perspective from the approach in America and I think it helped with my mathematical maturity. The second semester was great too. 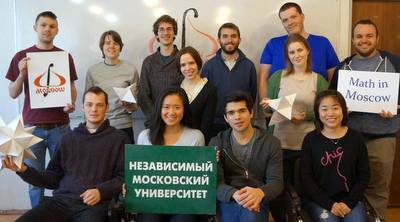 The Math in Moscow program was a fantastic learning experience both mathematically and culturally. The Russian approach to mathematics aligns nicely with my approach to the subject which resulted in an overall excellent experience. I would love to come back !